Years ago I traveled around the country by train and a large portion of it riding in the coach section. When I slept (often to pass the time) it was in an upright or partially reclined position in my seat. I learned how to “get in the zone” to fall asleep by using my hat to cover my face in order to dim the lights and ambient sound. I often have used this approach on flights as well. 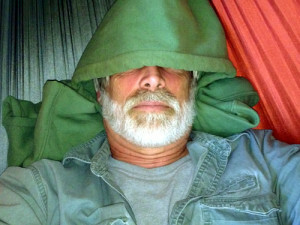 More recently while hanging in my hammock I was seeking the same slumber destination. 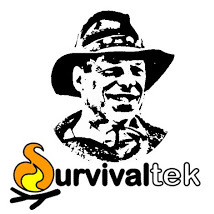 To get comfortable I use some type of support under my neck and have used an inflatable collar pillow but I have used items of clothing like a jacket to accomplish the same support. I got to thinking that a hoodie could be used to support my neck while the hood portion could be used over my head instead of a hat to diminish the light and sound so I set out to give it a try. The hoodie can be folded in different ways to accommodate different resting positions, namely whether you are vertical or horizontal. Essentially I spread the hoodie out face-down and start to roll the bottom hem upward toward the shoulder. When the rolled material reaches the out-stretched sleeves you can strategically leave the sleeves outstretched to be used to loosely tie the hoodie collar pillow around your neck to keep it in place while sitting upright. This helps when it is used in a seated position like when riding in a train or plane. If used in a hammock where the stabilization is not critical you can fold the sleeves across the back instead and continue to roll up the material to achieve a slightly thicker neck support and in each configuration the hood can be used to cover you head. On a slightly different topic of hoodies I would like to offer some thoughts on their colors. Whereas I like to blend with my environments I would use a neutral/subdued color while in urban areas but I would choose an ODC or earthtone when in outdoor situations. If that’s not your concern then color doesn’t really matter. In any event a hoodie makes a good “layer” of clothing to help regulate your comfort while in variable temperature scenarios as well as a sleeping aid while traveling abroad. Recently I took a plane trip abroad and decided that I wanted to try out the hoodie configuration that used the sleeves to tie around my neck to keep it in place while seated in the passenger seat. It worked very well but I ran into a complication. The hoodie that I used was a zippered model and when rolled up it created a bulge in the middle. I tried to place my neck on either side of the bulge but decided to take a different approach to folding it. I unrolled the hoodie and stretched out the zipper diagonally, then rolled the material straight up so that in effect the zipper created a spiral that evened out the previous bulge. 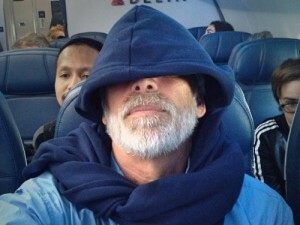 Wearing the hoodie for the flight worked great and enabled me to “Z-Out” quite easily. It was a light duty cotton garment but I may want to progress to a heavier material hoodie for colder weather with the added benefit of a more cushioned support for my neck. This entry was tagged Camping, Clothing, Hammock, Pillow, Travel. Bookmark the permalink.